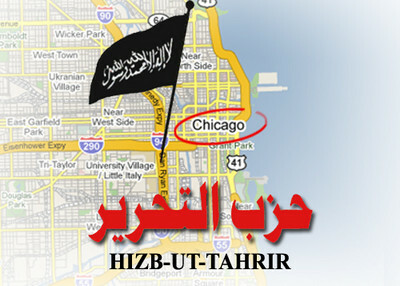 Imam Promises to Fight "Until Islam Becomes Victorious or We Die in the Attempt"
Oak Lawn, Illinois - Hizb ut-Tahrir (HT), the international movement to re-establish an international Islamic state ­ or Caliphate - kicked off a new campaign to win American recruits Sunday afternoon in this Chicago suburb. Nearly 300 people packed the Grand Ballroom of the Hilton Hotel for its Khalifah Conference on "The Fall of Capitalism and the Rise of Islam" to listen to HT ideologues blame capitalism for World War I and World War II; the U.S. subprime mortgage meltdown; the current violence in Iraq and Afghanistan; world poverty and malnutrition and inner-city drug use. A speaker identified as Abu Atallah even blamed capitalism for the late singer Michael Jackson's decision "to shed his black skin." Security at the conference was very tight. Oak Lawn police maintained a checkpoint outside the Hilton, and local police and HT's own security people had a substantial presence inside the hotel. In the ballroom where the conference took place, men and women were largely segregated, with men in the front and women in the back. This became a significant point of contention between HT supporters and several members of the audience who objected to this arrangement. At one point, an unidentified Hizb ut-Tahrir speaker became flustered over this line of questioning. "Men and women," he blurted out, must be kept separate "to prevent people from behaving like animals." A woman in the audience responded: "How does intermingling between men and women make you animals?" HT panelists didn't have a persuasive answer, and soon adjourned that session. The conference was sometimes poorly organized. There was no list of speakers, forcing reporters to sometimes guess at the spelling of speakers' names. But HT certainly appeared to be serious about working for the larger goals of the conference: abolishing capitalism and imposing Caliphate rule over the world. According to Hizb ut-Tahrir, the world's social and economic problems will not be fixed until the world is governed by Shariah and the government controls all major industries. Lenders would no longer be able to charge interest, which one speaker decried as a "poisonous concept." Charity, or zakat, was advertised as the way to alleviate "economic inequality." "Secular capitalism has made me devalue my skin" and "has kept my family in ghettos," said one speaker, an African-American who went on to blame it for the fact that he smoked marijuana and his grandmother played the lottery. Capitalism, he added, is a form of economic "terrorism" and "causes us to be sent to mental hospitals." Barack Obama's presidency, he said, "is only a scheme or con" to trick people into thinking that things will get better under capitalism. But time and again on Sunday, Hizb ut-Tahrir officials seemed to be playing slippery rhetorical games of their own - particularly when it came to the behavior of despotic Muslim regimes and terrorists. When a few skeptical audience members pressed speakers over the fact that Islamic governments in Iran and Saudi Arabia are despotic, conference speakers claimed those weren't "authentic" Muslim governments and that the CIA (and by implication, the capitalist U.S. government) was to blame for the problems in those countries. In an interview with WBBM-TV in Chicago, HT deputy spokesman Mohammad Malkawi refused to specifically condemn Al Qaida and the Taliban. Hizb ut-Tahrir has not been designated a terrorist group by the U.S. government and it insists it is only interested in instituting radical change by nonviolent means. But HT's alumni include 9/ll mastermind Khalid Sheikh Mohammed, the late Iraqi terrorist leader Abu Musab Zarqawi and would-be Hamas suicide bombers, and the group's pro-jihadist rhetoric has led critics to label it a "conveyor belt for terrorists." One Muslim American group issued a statement in advance of the conference condemning Hizb ut-Tahrir's radical ideology and challenging others to follow suit. "Hizb ut-Tahrir preaches an ideology that calls for the destruction of the principles that America is founded on," said Zuhdi Jasser, president of the American-Islamic Forum for Democracy. "While their words are protected by our First Amendment, their actions and movement must not be allowed to take hold. The silence of American Islamist organizations like [the Council on American-Islamic Relations] CAIR and [the Islamic Society of North America] ISNA in condemning the ideologies of Hizb ut-Tahrir and their agenda of insurgency in America speaks volumes to their own, albeit, more camouflaged Islamist agenda." HT's efforts to rehabilitate its image won't be helped by the menacing tone on display Sunday. One late-afternoon panelist suggested that modern industrial powers could fall to Muslims the way Mecca fell to Mohammed nearly 1,400 years ago. Audience Member: And so if the United States was a Muslim world, the Constitution would be gone?" Imam: "Yes, as Muslims they would be long gone." While Hizb ut-Tahrir's controversial message attracted demonstrators and some media attention, the group at least is open about its ambitions. It not only is determined to destroy capitalism -- it would shred the United States Constitution as well in favor of Shariah law. The history taught us from Byzantine empire to Indonesian Majapahit. From East Europe to West China. Islam, in political way, have three strategy to conquer just like Mohammed did to Medina and Mecca. 1. Send peaceful islamic people and islamic trader to target a region, make it majority to occupy administration offices. 2. After step 1, send radical islam people to brainwash and force peaceful islamic society to force sharia to be implement in their area. 3. step 3, calling jihad from other islamic with a reason that local govt oppose sharia law and killing islamic peoples. This is the proof. If European and America don't act now, what our ancestor will say. History is the lessons. Don't wait until it becoming a cancer. Strike now. proud one, and i wouldnt want it any other way. i just wish my fellow americans will not stereo type and shun islam because of a group or a man. i am active and working towards the american dream and raising my children the fair american ways. further nothing in islam says you cant be rich and have dreams. to my american brothers and sisters, before we pass our opinion in a subject we must understand both sides of the conflict. the middle east has nothing but conflicts since i was a child. why !! just think and try to find the true answer yourself you might just might see it in a different angel if you are fair and again hear both sides. americans are fair peopel always are and always will thats what made america the great country it is. God said in the Quran we mad you different tripes different colors so you may learn from each other and not to picker one another. Thanks to our immigration laws we have gone from 150,000 muslims in america in 1970 to 2.5 million of them now. So get ready to continue hearing more spewing and belching of islamic rhetoric in this regards. If nothing is done to stop current patterns of immigration - islamic influence culturally, politically, and socially will continue to increase here in America. That is what various cultures do - as they grow, they exert more dominance, power, and influence over the land in which the live - this also will include acts of terrorism. the problem with this website. instead of actually worrying about actual terrorism, this site seems deticated towards the identification of any group even slightly associated with terrorist activities, even though many groups with radical objectives have housed terrorists in their midsts merely because of a common goal, achievied through differing means. many have radical and by society's standards odd beliefs and objectives, however terrorism is based on using terror to control the people rather than convince them of an ideal or point of view. if this type of speech amounts to terrorist activity or can be associated with it, than most speakers for religios groups can be deemed in the same light. people like Tony Alamo, who is head of a radical fundamentalist Christian group believies that all must follow him or go to hell. this is certaintly subject to qualify for terrorist activity if the actions and words of Hizb-ut-Tahir are subject to such criticism. the point is that while these groups are opposed to religious freedoms and believe in international control, does not mean that one can call them terrorists/ or liken them to such in a website that would appear to be deticated not to terrorism but terrorism centered on radical islam. You are correct in saying that our right to speak is a wonderful thing to thank God for... but I don't think this right was intended to include speaking of the downfall of our country including the Constitution that protects our rights. Yes, again you are right, if this happened in a middle-eastern muslim country terrible things would happen to those who dared to speak against those in power... and IF we don't stop this fanatic anti-American activity we will soon be overtaken by these people who hate everything we stand for... and thanking God will have to be done in secret... or they will be cutting heads off HERE in the USA! Wake Up! They are here and getting ready to take over if they can.